Canola (Brassicaceae: Brassica spp.) is an important feedstock for biodiesel production and a potential ingredient for use in the food industry. In different continents, various arthropod pests damage canola plants. Stink bugs (Heteroptera: Pentatomidae) are present in all zoogeographical regions, and many species are recognized by their economic importance as crop pests. Our aim was to describe the composition, structure, and diversity of the assemblage of stink bugs sampled on canola in southern Brazil. A total of 878 pentatomids were captured, belonging to 27 species. The dominant species were Euschistus heros (F.) (n = 439), Dichelops furcatus (F.) (n = 160), and Nezara viridula L. (n = 79). The species richness estimators indicated the samples correspond from 79.7 to 93.1% of the richness estimated. Comparing canola to other monocultures, the richness of Pentatomidae was much superior. Otherwise, when compared to studies conducted in native vegetation and urban fragments, the richness is similar, and sometimes higher. This relatively high number of associations brings out the vulnerability of the canola fields according to the expansion of its cultivated area. Nine species of Pentatomidae are recorded on canola for the first time in Brazil. The most abundant species reported here are often stressed as stink bugs of economic importance in agro-ecosystems. The economic importance of each species varies greatly depending on the plant attacked. Detailed studies are needed to evaluate the damage caused to canola by stink bugs. This work was supported by a grant to ALMJ and PRVSP from Embrapa through the project Manejo da entomofauna na cultura da canola FMB was supported by a fellowship from the Coordenação de Aperfeiçoamento de Pessoal de Nível Superior CAPES-PNPD, Ministry of Education, Brazil. JG was supported by a fellowship from the Conselho Nacional de Desenvolvimento Científico e Tecnológico – CNPq (PQ#305009/2015-0). ARP was supported by a grant from the Conselho Nacional de Desenvolvimento Científico e Tecnológico – CNPq (PQ#400551/2016-0). 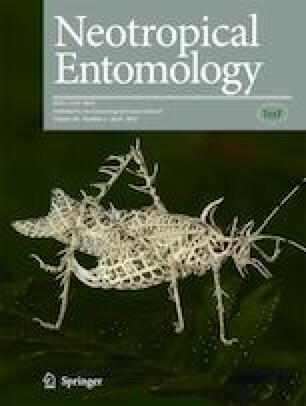 ALMJ, PRVSP, and ARP planned, designed, and executed field work; FMB and JG made the taxa identification; FMB analyzed the data; FMB and ALMJ wrote the first draft; all authors contributed to the final version of the paper.